The rubber tips used on rear package trays of hatchback Omni's, Shadows, etc. are the same as the tips used on 60s/70s mopar sunvisors. From member RV2. I don't know how this ever worked out, but I just saw one of these truck mounts in a yard the other day.. 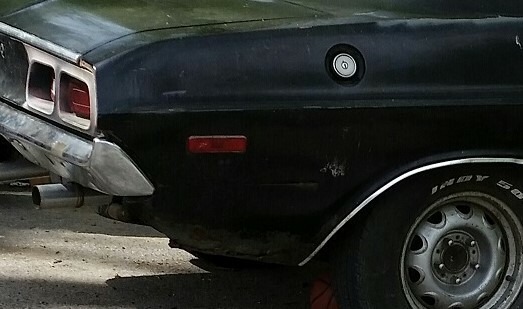 The air in the tires of a 71 Fury is the same exact type that was used in a 71 Hemi Cuda convertible. Maybe I should bottle up some genuine "Detroit Air" and sell it on Ebay for the numbers matching paint dab resto guys. Almost as good as NOS air! My dad has a 80gal compressor in his garage, that last ran in 1970. It still has lots of air in it. You paint daub guys here this?? Dealer? just go to autozone and pick one up in the aisle with all the "HELP!" parts in it. My dad's picked up 2 or 3 of them for his 74 Dodge van a few times. they're like $3 a piece. He also picked up a package of the wiper arm pivot bushings brand new in the same isle I believe the package was marked "Wiper arm pivot bushings. 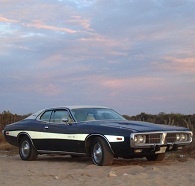 Chrysler 1974-Present" or something to that effect. '90s Imperial window motors work perfectly in '64-'66 Imperials. The later motor is in a bunch of other Mopars that I forget. Late '80s trucks, I think. Last edited by MrFoFody; 09/09/06 02:06 AM. I have found that lots of money can go into any Mopar. Small bolt pattern Rallyes will fit any newer front wheel drive Mopar w/14" tires. 15's are the same for the 4.5" bolt pattern. The glove box lock on a 72 to 80 truck will fit the console of an E-body. The 8 3/4 rearend housing out of an E-body will bolt into a 63 Dodge 880 with no modification! My neighbor was trying to get the drums off the axles and I convinced him it was easier/cheaper to put in the E-body housing. Radio's were interchangeable for years and years. My buddy had a later model (caravan?) radio in his '75 Dodge shortbed and dad had an AM/FM out of a '79 TC3 in his '75 Dodge pickup. '71 E-body console button/lock is the same as a '63 Dodge 330 glove box door button/lock. 5 on 4 1/2 boltpattern wheels will interchange with Buick, Toyota trucks, some Nissans.. Dad ran 14x6 ralleye's off of my Duster on his Toyota pickup for years. '65 C-body big block left motor mount and bracket are the same as '67-9 A-body big block. what about the hazzard button, being on column since 70 ? Nice! A lot cheaper than a '70. Voltage regulator off a carbed 80's fwd mopar will fit my 74 satellite perfect. Grabbed a good chrome one off a 84 shelby charger I parted. V-belt alternators will swap from the early 80's fwd's, but they're not terribly high output IIRC. convertible top mechanisms and windshield/ windshield moldings are the same on 66-70 B body verts.